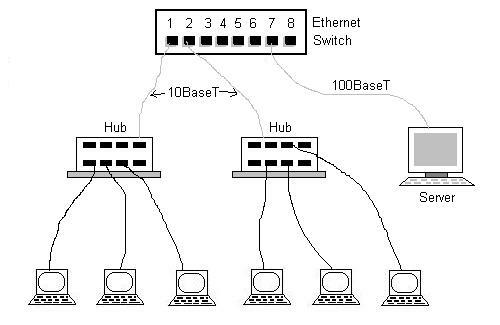 Network switches are identical to network hubs, but a switch is more intelligent than hub. Network switch inspects the packet, determine source and destination address and route the packet accordingly. By way of forwarding the packet to the appropriate device switches conserve bandwidth significantly. Now-a-days network switches are available with 10/100/1000 Mbit/sec as well as 10/100 Gbit/s ports. It operates at layer 2 of OSI Stack. It is often recognised as multiport bridge. There are 4 methods layer 2 switch uses as mentioned below to forward the packet. 1. Store and Forward- In this method, it buffers and performs checksum on each frame before forwarding. 2. Cut through- In this method, no error check is performed. Switch reads up the frame's hardware address and forwards it. 3. Fragment Free- This method is combination of above two methods i.e. Store and Forward and Cut through. This method checks first 64 bytes in the frame which gives addressing information. This tells switch which is the destination of the frame. Error checking is performed by layer 3 and 4 typically router of the end device. 4. Adaptive switching- A method to automate switching between the other 3 modes.